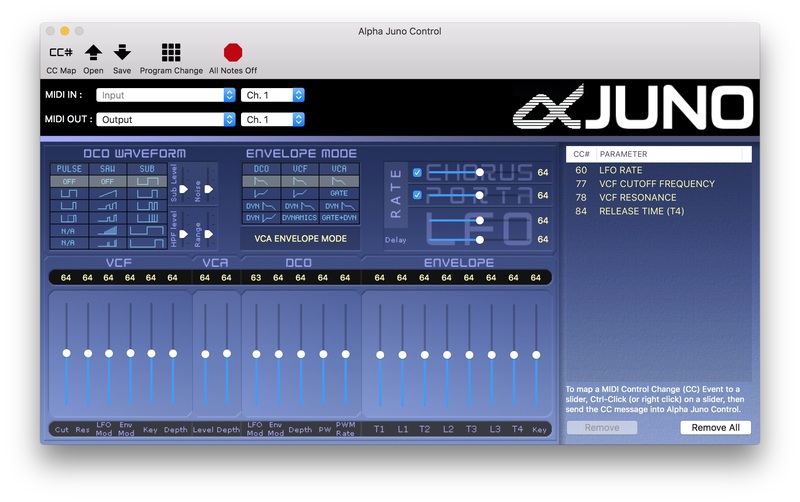 What is Alpha Juno Control? I’ve love the sounds in my Alpha Juno but I’ve always thought that editing the sounds was a bit of a pain. The LCD and "Alpha Dial" leaves a lot to be desired in terms of quick (and fun) editing. So I developed Alpha Juno Control. It is a small utility app that will let owners of Roland’s Alpha Juno keyboard control patch parameters via MIDI from their Mac. Think of it as a software version of the PG300. Does it support MIDI Learn? Yes. Right-click (or Control-click) any of the sliders to put the app into MIDI Learn Mode. While in MIDI Learn Mode, it will listen for any incoming control change message and assign the controller number to that particular slider. Can I use it with my MKS-50? Yes. The Alpha Juno series and the MKS-50 share the same functionality (MIDI-wise). Save this setting. Press and hold WRITE, then press MIDI again.